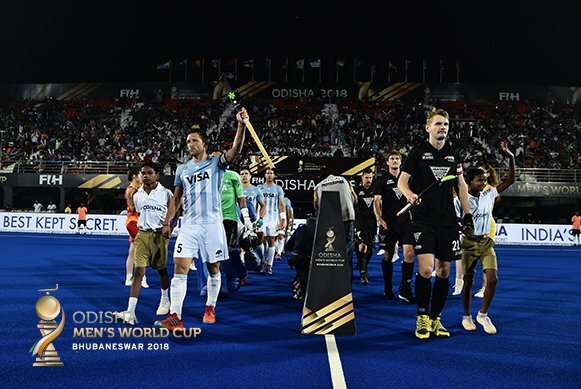 Bhubaneswar, India: Day Six of the Odisha Hockey Men’s World Cup Bhubaneswar 2018 featured the second round of matches in Pool A, with Argentina claiming their second successive Pool A victory to put themselves within touching distance of the quarter-finals. Argentina’s 3-0 victory over New Zealand sees them move onto six points at the top of the pool, three points ahead of second placed New Zealand with one round of matches to play. Spain and France – who drew in the day’s earlier match – ended the day in third and fourth position respectively. Spain (FIH Hero World Ranking: 8) and France (WR:20) started the day needing to recover from opening day defeats – Spain lost to Argentina while France fell to New Zealand – and get some crucially important points on the board. France struck early in the contest when Victor Charlet’s perfect backhand pass was guided home from close range by Timothée Clément, who changed the trajectory of the ball to give Spain shot-stopper Quico Cortes little hope of saving. The Red Sticks dominated the second quarter, setting up camp in the opposition half but unable to get the goal that their endeavour deserved thanks to some excellent saves from France goalkeeper Arthur Thieffry. While a penalty corner drag-flick from France captain Victor Charlet forced a fine save from Cortes in the third quarter, it was the Spaniards who remained on top and finally got their equaliser early in the fourth period. Alvaro Iglesias was the scorer, completing a slick passing move that cut through the France defence and allowed Spain’s number nine the easiest of finishes. Although it proved to be the final goal of game, France missed a gilt-edged opportunity to claim all three points when a penalty stroke from Hugo Geneset was brilliantly saved by a diving Cortes, cementing his position as the Odisha Player of the Match in the process. In celebration of the International Day of Persons with Disabilities (IDPD), before the start of the match the players of Spain and France were introduced to Guest of Honour Md Jafar Iqbal, a member of the India’s World Cup winning blind cricket team. Two teams that claimed victories in their first matches went head to head in the second game of the day, with New Zealand (WR:9) determined to upset the FIH Hero World Rankings by attempting to get the better of reigning Olympic champions Argentina (WR:2). Despite a difference of seven places in the rankings, New Zealand held their own for much of the opening quarter, limiting Los Leones to half chances. Argentina eventually made the breakthrough midway through the second quarter thanks to a terrific backhand strike from Agustin Mazzilli, who picked out the top left corner of the Black Sticks net for his third goal of the competition. Argentina made it 2-0 in the third when New Zealand captain Blair Tarrant was robbed of possession in his on circle by Lucas Vila, who made no mistake with a blistering finish past the left hand of Black Sticks goalkeeper Richard Joyce. The match scoring was completed by Lucas Martinez five minutes from the end, who dived in to make it 3-0 from close range after Argentina’s initial penalty corner attempt had been blocked. The action continues on Tuesday 4thDecember 2018 with two crucial matches in Pool B. Australia (WR:1) will be looking to consolidate their position at the top of the table when face England (WR:7) at 1700 before Ireland (WR:10) take on China (WR:17) at 1900. The Kookaburras were victorious over Ireland in their first Pool B match, with China holding England to a draw. The day’s results are certain to be significant in the potential finishing positions in this group. Australia coach Colin Batch felt that his team would be given a stern test by England, stating: “We will have to overcome a motivated England team who conceded a late goal to draw their match against China. While they will be disappointed with the outcome, statistically they did very well in the match so I don’tsee them making many changes to their style of play.